LOS ANGELES, Calif. /California Newswire/ — Since 1989, when Food Finders, Inc. officially started "rescuing food" to donate to needy agencies and shelters who feed the hungry, the nonprofit has collected and redistributed 100 million pounds of food. This tremendous milestone was reached this month, coinciding with its 24 year anniversary. Diana Lara, VP of Operations for Food Finders, coordinates all the logistics of the donations and deliveries. She shared, "I am very proud of our 100 million pounds rescued! Yet, despite our efforts, food insecurity continues to rise – 49 percent from 2001 to 2009 – with the largest increase among households with children. According the National Resources Defense Council (NRDC), 40 percent of edible food goes to waste in the U.S. We as an organization and community need to continue to build awareness and seek additional donations of food." Food Finders, headquartered in Signal Hill, Calif., focuses on reducing food waste in our local communities, rescuing donated food from restaurants, grocers, caterers, bakeries and more. Its team of caring volunteers and staff drivers deliver the food daily to more than 200 nonprofit social service agencies, shelters, centers and churches located throughout Los Angeles and Orange counties. Food Finders recently celebrated this milestone at its 2nd Annual Swing Dance, an anniversary event that featured a 17-piece band and plenty of dancers to kick up their heels. A special banner was displayed to announce the significant accomplishment. Each year the nonprofit sets a goal to collect even more food than prior years, which means it also seeks additional donors to add to its existing list. For 2013, the goal is to collect and redistribute 7.3 million pounds of food. This will provide enough for 41,000 meals per day. Any food vendors or hospitality businesses wishing to support Food Finders should call Diana Lara at 562-293-1400, x101. On May 1, 2013, Food Finders is kicking off its 3rd Annual "Summer To End Hunger" Food Drive. The food drive will run through the month of May, and food that is collected during the May 11 event, "Stamp Out Hunger" postal drive, will contribute to the overall Summer food drive. Food Finders is a 501(c)3 nonprofit community-based food rescue organization that serves as a conduit for food, education, and awareness between donors, volunteers, agencies and people in need. Our vision is to eliminate hunger and food waste, while improving nutrition in the communities we serve. Headquartered in Signal Hill, Calif. (Los Angeles County), Food Finders picks up donated food from hundreds of local grocery stores, bakeries, restaurants and produce markets and distributes it directly to more than 200 missions, shelters and social service agencies to feed the needy and impoverished. 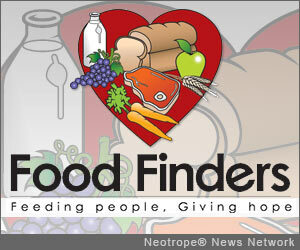 Learn more at: http://www.foodfinders.org/ .